Owning your own treadmill can make for a convenient and year-round way to continue running to stay in shape. But if you live in an apartment or with a noise-sensitive family, you may get complaints about your noisy machine. The location in which you place your treadmill can have a bearing on its noise level, while routine maintenance, servicing and lubrication can help reduce treadmill noise for an effective, yet quieter workouts at home. Move your treadmill to a carpeted area of your home, if possible. The user's manual for the Horizon Fitness T401 treadmill notes that a treadmill sitting on carpeted concrete will typically be much quieter than one resting on a wood floor. If you have the choice, carpet the area where you plan to install your treadmill, or put down a large rug to help insulate some of the noise. This will help quiet the noise of the treadmill working, but also the sound of your steps as you run. Invest in a rubber treadmill mat to slide under your machine for better sound insulation. They're easy to find at fitness supply stores. Not only will they help reduce treadmill noise, but they give the added protection of a no-slip surface to rest your treadmill upon. Set your treadmill up in the middle of the room, especially if your treadmill is in a common area of your home where other residents frequent, including the living room or den. 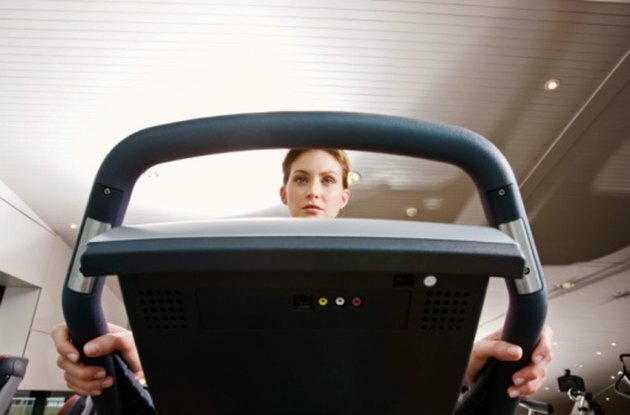 When you push your treadmill up against a wall, it may be out of the way, but it can also cause the loud sounds of the treadmill to bounce off the wall and make the machines seem louder than it actually is. A central location is more effective. Lubricate your treadmill's belt every few months. The belt maintains steady contact with your treadmill's rollers, and increased friction can mean increased noise. The directions for lubricating the belt vary for each treadmill, so read your instruction manual to ensure that you're lubricating the belt properly for your machine to avoid mistakes or safety hazards.